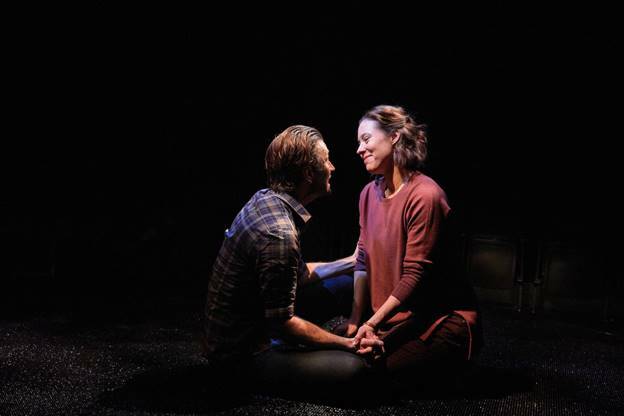 Director Rob Ruggiero has crafted an intimate look at personal relationships in the fascinating “Constellations” currently playing at Hartford’s TheaterWorks. Upon entering the theater, composer-musician Billy Bivona is playing electric guitar, creating music that compliments and underscores the shifts of emotion and energy generated on the bare circular arena stage. A bright circle of light above the stage dims and the theater ceiling explodes with light, giving the illusion of the cosmos. From the moment the actors begin to speak, you know this 75 minute one-act is going to be unique. Allison Pistorius (Marianne) is a Cambridge University theoretical physicist who explains many of the themes of the show that bridge the worlds of theoretical and quantum physics by translating them into questions of free will versus destiny and fate. M. Scott McLean (Roland) is a beekeeper who expounds on the lifecycle of the bee and the specialization that is integral to the maintenance of hive life. These two gifted actors guide us through the multiverse—the hypothetical set of possibilities that make up what we, the audience, recognize as love, loss, mortality, and possibility. Don’t let the scientific jargon fool you. This play focuses on how we make decisions and live with the consequences. The play is described as a romance, but the rapid fire dialogue draws the audience to these characters in an almost dizzying fashion. We become a part of their universe, and in so doing, explore why we exist and the existential dilemma of finding our purpose in a world that will go on without us, whether we want to admit it or not. The brilliantly crafted script is by Nick Payne, a British playwright who won the London Evening Standard Theatre Award for Best Play in 2012 with “Constellations.” As I watched, I felt that it was part scripted play, and part performance art. Bivona’s ethereal electric guitar music (a brilliant addition by Ruggiero) so tunes us into our senses, the words and gestures of the actors become extensions of our sense of self. This intelligent, accessible portrayal of a romantic relationship is what romance is all bout—the transformation of what we say into what we can feel. Probably I’m one of the few people who has not seen the entire 1989 film version of “Steel Magnolias” (I have seen PART of it though), so Playhouse on Park’s current production of Robert Harling’s comic gem was a totally new experience. This all-female show perfectly defines ensemble piece, allowing each actress to display her comic, and dramatic skills. Set in the fictional town of Chinquapin, Louisiana in the 1980’s, the audience first meets Truvy Jones (Jill Taylor Anthony), owner of the hair salon where the play’s entire action takes place. Annelle Dupuy (Liza Couser) is Truvy’s nervous new assistant. Frequent customer Clairee Belcher (Dorothy Stanley) is Chinquapin’s former First Lady and high school football aficionado. Soon-to-be bride Shelby Eatenton (Susan Slotoroff) and her controlling mother M’Lynn (Jeannie Hines) are being coiffed on Shelby’s big day. Last, and certainly not least, is Ousier Boudreaux (Peggy Cosgrave), the most sharp-tongued of these Southern Belles. The women in this production are all first-rate and full of charm and elegance. The play’s focal-point is the mother/daughter conflict between Shelby and M’Lynn. Susan Slotoroff’s Shelby is the play’s lifeline, whose radiant smile and positive view of life shines brightly on all. Jeannie Hines’ M’Lynn’s understated calm has its cathartic release in her moving monologue in the final scene. Liza Couser’s pitiable Annelle achieves a fine balance between humor and pathos. Jill Taylor Anthony is a warm, serene Earth Mother among the drama that blooms around her. Peggy Cosgrave’s prickly, yet ultimately compassionate, Ousier spouts some of the play’s funniest lines including, “I’ve been in a bad mood for forty years!” Despite delivering some witty lines, actress Dorothy Stanley’s timing is a bit off, causing the show’s pace to slow down ever so slightly. Director Susan Haefner has created a bright and delightfully funny show for all to enjoy. David Lewis’ scenic design highlights this warmth and realism in the beauty salon through the use of period driers, hairspray cans, and actual hair strewn over the stage. Kate Bunce’s colorful costumes add to the ambience of the 80’s. The show’s Dialect Coach David Alan Stern merits special attention for not only coaching these Steel Magnolias, but also the film’s stars as well (his website www.LearnAccent.com is listed in the show’s program).